Experimental Theology: Letters from Cell 92: Part 2, "Who is Christ for us today?" Letters from Cell 92: Part 2, "Who is Christ for us today?" What does Bonhoeffer mean by "religionless Christianity"? 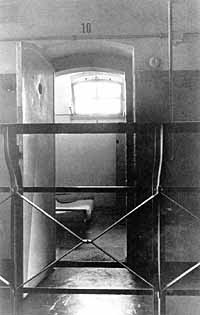 As noted in Part 1, there has been a great deal of speculation about Bonhoeffers's theological letters from prison. 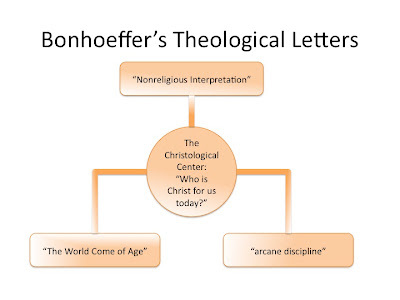 For example, many of the "death of God" theologians in the 1960s saw Bonhoeffer as their patron theologian. But most theologians tend to follow the interpretation of Eberhard Bethge, the man to whom the letters were addressed, Bonhoeffer's closest friend, and the man who wrote the definitive biography of Bonhoeffer. In short, the central issue behind the letters is Christology, the question "Who is Christ for us today?" If our final judgment must be that the Western form of Christianity, too, was only a preliminary stage to a complete absence of religion, what kind of situation emerges for us, for the church? How can Christ become the Lord of the religionless as well?...How do we speak of God--without religion, i.e., without the temporally conditioned presuppositions of metaphysics, inwardness, and so on? How do we speak (or perhaps we cannot now even "speak" as we used to) in a "secular" way about God? In what way are we "religionless-secular" Christians, in what way are we those who are called forth, not regarding ourselves from a religious point of view as specially favored, but rather as belonging wholly to the world? In that case Christ is no longer an object of religion, but something quite different, really the Lord of the world. But what does that mean? What does it mean for Christ to be Lord of a "religionless" world, a world "come of age"? For Bethge, these questions are critical to understanding what Bonhoeffer is wrestling with. Bonhoeffer wasn't, as some have mistakenly assumed, trying to figure out a way to translate religious categories into a secular ("religionless") language to make faith palatable to modern persons. Rather, Bonhoeffer was trying to understand how Christ could be "Lord of the world" in a world that didn't recognize Christ's existence or seem to need him. In that kind of world, who is Christ for us? In his letters Bonhoeffer tries to crawl toward an answer. 1. "World come of age." Most interpreters of the letters have tended to focus on Bonhoeffer's comments about "religionless Christianity." This is only natural as these passages are the most shocking and explosive, theologically speaking. 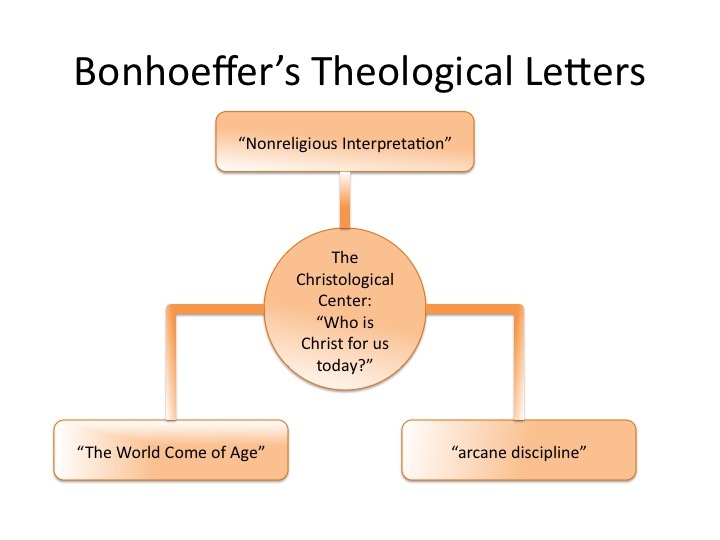 But according to Bethge, if we place "religionless Christianity" at the theological center of the letters we'll misunderstand Bonhoeffer's project. This is, in fact, the mistake made by the death of God theologians. Again, for Bethge, to understand Bonhoeffer correctly we have to place the Christological question at the center of Bonhoeffer's concerns. This is the center of gravity. Thus, any discussion of a "religionless Christianity" has to orbit the central question: Who is Christ for us today? 1. A Stocktaking of Christianity: What is Christianity in a "world come of age"? 2. The Real Meaning of the Christian Faith: The "nonreligious interpretation"
3. Consequences: The practice of the "arcane discipline"
Bonhoeffer's theme entails setting out in order to discover the presence of Christ in the world of today: it is not a discovery of the modern world, nor a discovery of Christ from this modern world, but discovering him in this world...Hence this question governs Bonhoeffer's dialogue and must preserve, in the correct relation and proportion, the explosive formulas of the world come of age, nonreligious interpretation, and arcane discipline. Without the overriding theme of this question these concepts would fall apart and become stunted or superficial. As isolated intellectual phenomena, they have little to do with Bonhoeffer's thought; but within the christological perspective of his central theme they achieve their full and independent justification. So that's the question going forward: Who is Christ for us today? Bonhoffer's faith was his personal commitment to not escape or ignore his country's need for an advocate. In his personal time frame, he suffered persecution, and tried to understand it from a "Christological faith stance". There is nothing wrong with this, IF this is how one wants to work out his "salvation". It must be first and foremost a personal conviction and commitment in what one chooses to do. Thus, it is a religionless faith. While Bonhoffer chose to go back to Germany, and identify with his people, others might have chosen a different path. And their choice would also be a religionless faith, but it might not be a Christological faith. As far as developing a nonreligious context goes, I think Ernest Becker has accomplished a lot of the work, especially in his book, "Denial of Death". It might be the most cogent work on Sin and Idolatry that I know of, by his showing how these ideas pertain utterly intimately to our existential situation of being human: the difficulty of which lies in the fact that being human is not an automatic process as it is in any other existing thing. Not only do we have to work at becoming fully human, we have to choose what it means to be fully human. This is our most difficult task and there's plenty of forms which might be easier to accomplish (idolatry in effect) but in the end, can't reach the goal of Fullness of Being (sin). Christ today: The least of these. . . . Your suggestion that idolatry imposes an obstacle to "being human", is just what sectarian religious traditions affirm. These see only "God" or "humanity" as the "true focus", whereas, those that believe there is no obstacle, as such, affirm, delight and enjoy their life, as to their personal goals. Bi-fucation in thinking happens when we objectify others in their personal choices. And this is what brings political and/or personal conflict, because what we deem as a "right focus" is not another's. What if a psychologist judged everyone's life goals, by his own personal interests and standards? Or a corporate executive? One has to come to his own sense of "self" and adhere to what values he deems as most important. This is integrity. And it has little to do with religion, sacred/secular distinctions, but this view has to have political freedom to express such differences! Wow, would have assumed you'd get more comments on this Richard. The Christological question definitely seems to be the crux, but "Who is Christ for us today?" is a different question than say "Who is Christ for those who assume a quasi-Barthian view of revelation?" where work-based religion is tautological. I think another way to see our inquiry into religion-less Christianity, is to ask if its core ideas like sin, salvation, redemption, repentance etc., are reducible to modern concepts such as "self esteem" etc.? Personally, I don't think these concepts are reducible. I do think though that we have much to offer in filling out their understanding and parsing of human reality. Actually, I think we have a responsibility to do this. I'm wondering about this in context of your own "deprogramming" and qb's sense of "reprogramming". Obviously in your venture of deprogramming you changed your "thoughts"--which themselves are the conceived "offspring" of your "thinking". Yet the Patricia who is thinking today, is the Patricia who was thinking yesterday. So what's the nature of your thinking? You went from centering around one group of thoughts to centering around another. You could only do this through thinking. David, I'm going by what Jesus said in Matt. 13:33, and in that instance leaven was not representing sin. Jesus says specifically "The kingdom of heaven is like yeast ... until it worked all through the dough." (NIV) Obviously you need more than dry ingredients to bake bread, but Jesus wasn't posing as Julia Childs or writing a cookbook. Ditto on Matthew 13. What leads you to think that leaven did not represent sin in that parable? And, if it doesn't, why the change from all the other uses of it to represent sin? Julia Childs with an Israelite accent .... an interesting picture. Kingdom of heaven (subject) l is (verb, form of "to be") \ yeast (noun renames the subject). Apparently Jesus thought the illustration as He told it was sufficient for his listeners. Grammar is always important in trying to figure out a text. But, that is not the problem here. There are several parables in ch 13. The one starting in verse 18 is explained starting in verse 36. You said that what Jesus said was ‘sufficient for his listeners.’ Well, then why did he have to explain it for his disciples? Note as He explains he says things like ‘the field is the world’ in verse 38. The word ‘world’ does not occur in His telling of the parable. That is because in the parable the word ‘field,’ which does appear, represents the ‘world.’ Unless He explains that nobody would have known it. So, I repeat my question, how do you know that ‘leaven’ does not represent ‘sin?’ I am sure you know that this is a parable and language is being used in a figurative sense.